The proposed development lies within the battlefield site. 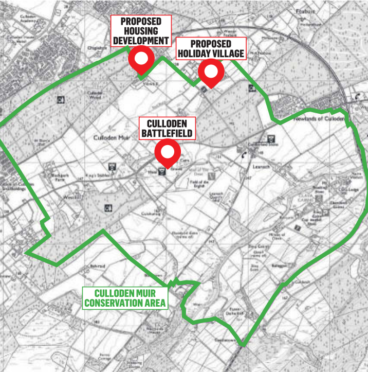 A leading Jacobite historical association has formally objected to plans for a four-star holiday village and 100-seat restaurant near Culloden Battlefield. The proposals would involve converting a small riding centre into a development incorporating 13 lodges, a cafe, shop, laundry and restaurant. But the 1745 Association, which works to preserve the memory of those who participated in the historic rising, has lodged an objection to the Treetops development. The location was reputedly where the government troops “saddled up” before going into battle against the Jacobite Army supporting Bonnie Prince Charlie’s claim to the throne in 1746. Association chairman Michael Nevin said: “The Treetops proposal represents a significant threat to the integrity of the battlefield site. In its objection the Association highlights that previous planning applications for small scale developments such as single houses or stables at the same site, officially within the battlefield conservation area, have been refused or withdrawn. The Association also say that the local infrastructure is not designed to accommodate the extra traffic which would be generated by the development, that it would “compromise the conservation area” and that there are other available sites. Mr Nevin, a professional economist, also said that visitor numbers to Culloden nearly doubled to 180,000 in the three years to 2017, bringing more spending power and jobs into the Inverness area. Site owners Inverness Paving said previously that the development could create up to 25 jobs and that it will “considerably improve and enhance” the setting, stressing the site is completely invisible from the battlefield and sits within mature forested areas. They also said an archaeological survey was carried out over the pinewooded area and no historic artefacts, remains or any item of note or interest, were discovered. Plans for the development were submitted in March and there been 162 objections and no letters of support lodged with the local authority’s planning department. In the same month, councillors approved amended plans for the design and layout of 16 homes at Viewfield, half a mile from the battlefield.